It was great to be able to March for Science in Santa Barbara, on Earth Day! The holiday got its start in 1970 in Santa Barbara in the aftermath of a disastrous oil spill. The March had a great turn out, including some really creative signs. 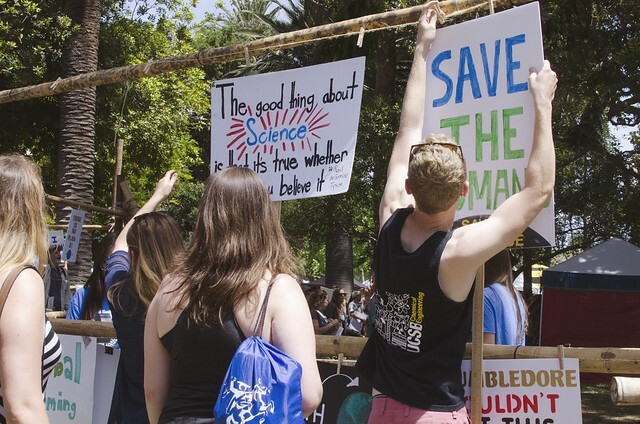 After a strong rally with Senators, mayors, and researchers taking turns at the podium, the march made its way down to the beach, then back up to Alameda Park to join the city's Earth Day festivities! My favorite part was the Activism as Art area at the festival, which allowed marchers to leave their signs as part of the installation rather than littering!